Grow Locksmith Revenue Dramatically With FieldSurf. The locksmith business has changed. Until recently, most locksmith services handled mainly emergencies and maybe handled some regular maintenance customers. Today, locksmith companies handle other elements of the security mix, including surveillance cameras, controlled access entry systems, safes, and other elements of security. Lately, a number of field service management systems have come onto the market that enables you to grow locksmith revenue. All these systems promise to automate your business, helping you to become more efficient and promising to make your locksmith business make more money at the end of the day. So which is the right software to help grow locksmith revenue? When you want to grow locksmith revenue, look no further than FieldSurf. FieldSurf is the most dynamic, versatile and useful field service management system on the market today. It is packed with features that will totally automate your locksmith business and bring it into the 21st century. Let’stake a look at the individual features of FieldSurf and see how it can help your locksmith business and help you grow locksmith revenue. When it comes to Inventory management, there is nothing on the market like FieldSurf’s inventory management capabilities. Controlling your inventory is vital in today’s competitive business environment, and no other field service management system gives you control of your inventory the way FieldSurf does. When new items arrive in your warehouse — these can be security cameras and systems, controlled-entry lock systems, safes, locks, keys, or any other inventory that a locksmith business might use on a regular basis — FieldSurf lets you enter the product into the system. It allows you to scan in a picture of the item, the item’s product barcode, and the number of items entered. Then, when one of your field technicians removes an item and places it in his service vehicle, FieldSurf makes a note of that. Then, when your technician sells that item to your customer, FieldSurf notes that the item has been sold, and reduces the number of your inventory of that item by one unit. FieldSurf also tells you that the technician no longer has that item in his vehicle. FieldSurf will then track the number of Inventory items you have sold, and can always tell you when you are running low on any item and have to order more. With FieldSurf, you never run out of inventory. You always know exactly how much of any item you have at any given time. And all of FieldSurf’s reports are in real time. You can access FieldSurf at any time and your inventory will always be up to date — even reflecting sales of product that you might have just made today. With FieldSurf, you are always in charge of your inventory and you always know exactly where you stand. But FieldSurf is so much more than an Inventory management system. FieldSurf has a host of incredible features to fully automate your business and help you grow locksmith revenue. Let’stake a look at some of FieldSurf’s incredible management features. Once you install FieldSurf, it will totally automate your entire scheduling and dispatch functions. Your dispatchers have total control over what’s going on with your dispatchers in the field. FieldSurf removes all common errors in scheduling and dispatching — double booking, sending your technician to the wrong address, or forgetting to create an Invoice for a Work Order. Everything is automated and if something goes wrong, you or anyone in your organization can detect the problem/s immediately. With FieldSurf’s locksmith software, your entire accounting department is fully automated. Gone are the days of having to ask your accounting people to generate reports — about sales, unpaid invoices, or anything else an accounting department needs to stay on top of. With just a few clicks, you always know exactly which jobs have been completed and which haven’t, which invoices have been paid, and which invoices are still outstanding. And these reports can be generated by anyone: you, as the business owner, can access FieldSurf’s powerful financial reporting directly, and you don’t have to wait while your accounting people generate the important reports you requested. And FieldSurf can be accessed from anywhere. You can use it with any desktop computer, any tablet computer, and is even accessible through your smartphone, so you can access FieldSurf from anywhere via your smartphone — you don’t even need to go into the office or sit through all those face-to-face meetings. And FieldSurf’s reports are in real time: it will even reflect activity done today. There’s nothing like FieldSurf to give you instant access to your latest financials from anywhere at any time. FieldSurf is Easy to Install, Easy to Use. The best thing about FieldSurf is its ease of use. There is no software to download. Simply register your company with FieldSurf, enter your customer data, and you can be up and running on day one. 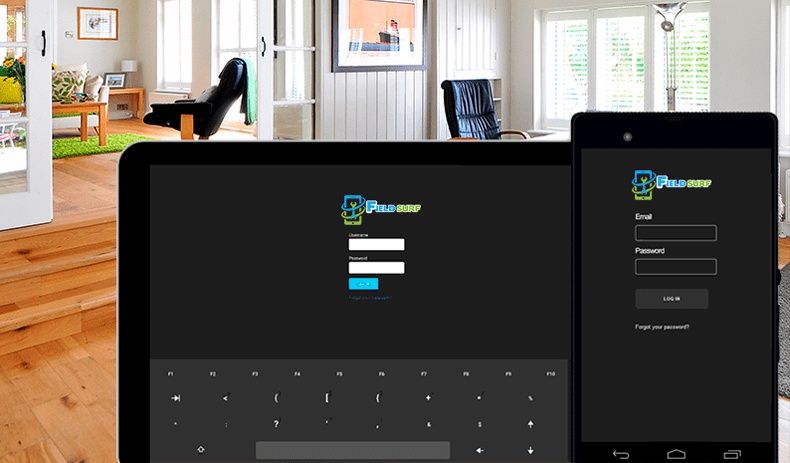 FieldSurf allows you to designate your personnel as either an Admin or a technician. You can select which FieldSurf modules can be sen by which of your personnel. And if you’ve been using Quickbooks to manage your accounting and reporting, you will be thrilled to know that FieldSurf integrates seamlessly with Quickbooks: simply enter your customer data and you’re off and running. FieldSurf is 100% Internet-based, so you can access any of your business’ data from anywhere at any time. FieldSurf will automate every aspect of your locksmith business, and will help you grow locksmith revenue like no other field service management system can. You owe it yourself to check out FieldSurf and see what it can do for your locksmith business. FieldSurf will change the way you do business: it will not only help you grow locksmith revenue, it will help you gain total control over every aspect of your locksmith business. FieldSurf lets you dramatically reduce paperwork, increases your efficiency and makes your staff happy, more efficient and therefore more productive. No other field service management system does what FieldSurf does. You owe it to yourself to take a good look at FieldSurf and see how it can dramatically improve the efficiency of your business and help you grow locksmith revenue.